Nairobi Heroes: My Part in the Rise of Goan Soccer in Kenya. 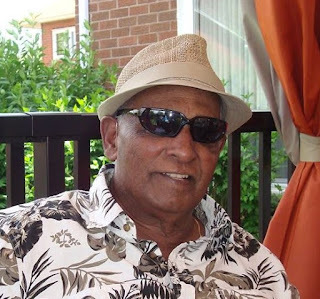 Johnny Lobo born in Nairobi Kenya on 27th December 1927.
and the proud grandparents of 7 grandsons: Jeremy, Julian, Liam, Matthew, Ethan, Mark and Owen. This is his story, in his words, unedited. He wrote the story long hand and his wife typed it up! consisting of Wood & Iron and Stone quarters for the Goans and the Indian staff. With 50 Goan families living in close proximately there were a great number of school going boys all eager to play soccer. We played on the open ground in front of the stone quarters from 4.00 p.m. to 6.00 p.m. every day. The half an hour breaks each day helped us to kick the ball around. The older boys mostly from Town and Parklands area had already established themselves and played on the main ground which had two goal posts. None of the Ngara boys, including myself, was asked to play until one day a guy came up to us and said that their regular goalkeeper was sick and if anyone of us would like to play in the goal. I quickly jumped up and volunteered to do so. Standing between the goal post, I was determined to do my best. I saved every ball shot at the goal and when the bell rang some of the players came up to congratulate me. The next day, I was asked again to stand in the goal and I repeated the same performance. The players were shocked and I was told from now onwards I would be the goalkeeper for the school team. We switched to playing soccer in the evenings and one day, Fr. Butler (who used to watch us play) asked us if we would like to play at the Italian camp at Kahawa. We were delighted and a bus from the camp would pick us at the school to take us to the camp. At first it would be a training session and then we played full time. This gave us a tremendous boost as some of the Italian players were professionals. The war ended in 1945 and the camp was then closed. Fr. Butler was transferred to Mombasa, where he eventually became Bishop, and we left school and took up employment. We all joined the Goan Institute hoping to play together but only two of us were selected. Xavier Santiago and myself. The others did not even get into the second team and so they felt bad. After playing one season, we decided to leave and form our own team. against the Goan Institute in the Salus Cup. This game was reported by John J. D'Souza in the book Stars Next Door, produced by Cyprian Fernandes. The above ran two tournaments called the Nazareth Bros. Cup and Dev Dutt Shield which was open to all Asian Teams such as the Goan Institute, Sir Ali Muslim Club, the Visa Oswald, Sikh Union, and the Nairobi Heroes. We had no difficulty winning these cups. The Kenyan Goan Sports Association hosted a knockout tournament called the Salus Cup. The Salus Cup was a sure win for us. We travelled to Mombasa a few times and we never lost a game even though we were playing at the low altitude at the coast. Not many Clubs entered and so we too would not participate if we were committed to other games. We however, never lost a game in this tournament. The Football Association of Kenya was open to all European and Asian Clubs in Kenya. 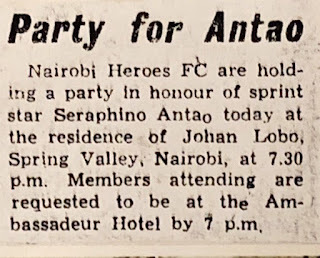 This tournament was called the Nairobi and District Leagues. The European teams consisted of: Caledonians, Juventus, R.A.F., the British Armed Forces, Impala Club, and all the Asian Clubs. The Goan Institute and Nairobi Heroes were also participants. In this round Robin League, we had a 100% win record. England, Scotland, Goa, India, Pakistan, Seychelles and the formidable Africa. As the selectors for the Goa team were all from the Goan Institute and many players from the Nairobi Heroes including myself were not selected, Goa did not reach far in the tournament. In the second year, ten Heroes were selected and the only exception was Saude George from the G.I. Our first game was against Africa and was on the Railway European Ground. The crowd was so big that a lot of damage was done to the fencing and the fans also climbed on the Cricket Screen, which collapsed with the weight. The game ended in a draw. No goals were scored. The F.A. informed us that the next game must be played at the Stadium for better crowd control. The second game again ended in a goalless draw. The third game we scored two goals in the first half but on resumption of play Africa put a lot of pressure and equalized and so once again the game ended in a draw. By now our trip to the East African coast was due, so we left for Mombasa, Tanga, Zanzibar and Dar es Salaam. Our first game was against the Coast African XI at the Macupa Stadium which we won by 1-0. We then left for Tanga by the B.I. Ship S.S. Karanja to play against Tanga Combine, which we also won 2-0. We then took a local ship to Zanzibar where we were due to play against the Zanzibar Gossage Cup team. There was no score in the first half or second half, but unfortunately the Referee decided to continue with the game till it became quite dark. Zanzibar then scored to win 1-0. The referee had given 20 minutes of extra time on his own. As it was more of a practice match to play the game for them, we accepted the outcome. We were entertained to dinner by the officials which was greatly appreciated. Next day we left for Dar-es-Salaam by the local steamer to play the Goan Institute. We won this game by 1-0 but as the game developed into a rough play, we were not offered any drinks after the game. The next day we left Dar- es- Salaam for Zanzibar on the S.S. Modesa to a great welcome by the Goan Community. We were scheduled to stay in Zanzibar for 4-5 days and then planned to board the S.S. Karanja on its return trip from Durban to Mombasa. Unfortunately, Robert Santiago contacted chicken pox prior to sailing. We could not take him to a government or private doctor as they would surely quarantine him. We approached Mr. D'Silva who ran an Herbal dispensary called Kipondo. His son was Ladis D'Silva and he was a strong supporter of our team in Nairobi. He willingly agreed to accommodate Robert and myself as I agreed to stay back. In 3 days Robert was cured and well. We then received a telegram that both of us were selected to play against Africa in the fourth game. We left Zanzibar by E. A. Airways in time for the game. We lost the match 2 - Nil and so ended a marathon duel and the last of the Maxwell Brady Cup. We received an invitation from the Baganda Football Association through the Goan Tailors Society Kampala to play in the opening ceremony of the New Nakivubo Stadium by the Kabaka. We accepted and were greatly honored. We traveled by train and arrived Kampala after a long and very comfortable journey. There we were met by the Representative of the Tailors Society, who took us over to the Club where we were accommodated. The next evening, we went to the stadium which was full to capacity. There was no score in the first half as our defense played very well to keep them at bay. In the second half George Rodrigues scored a brilliant goal followed soon after by a great header from Billy Gomes, to lead 2 - Nil. However, 5 minutes before the final whistle the Buganda team got a consolation goal. The Kabaka was amazed and so asked his aides that he would like to meet the team. We lined up and he thanked us for coming and praised us for the good game we played. He said he never knew that Goans played so well in football and said that they were only good at cricket and table tennis. We were entertained lavishly to a barbecue dinner and drinks. The next day we boarded the train, much to the delight of the catering staff who donated a case of beer and so we had a grand celebration on the last sitting for dinner. We received another invite from the Goans in Nakuru (Rift Valley) to play against the Rift Valley Sports Club, mainly a European side. In previous encounters the Europeans would trounce the Goans and to make matters worse teased them that the Goans are no good in football. We soon got down to work on our trip and to our luck a strong supporter of our side, a Sikh gentleman in charge of the transport section of East African Airways volunteered to drive us to Nakuru (100 miles) in an EAA bus. We arrived at the ground had a light refreshment and got down to play. We had no difficulty in beatings the Europeans six goals to nil. Here I would like to mention some fantastic display of footwork and passing by Cajetan Fernandes and Robert Santiago who made circles around our opponents. The next day we played against the African XI at the Stadium. We won the game 4-2 and received a standing ovation all the way from the Goans to the road leading back to Nairobi. 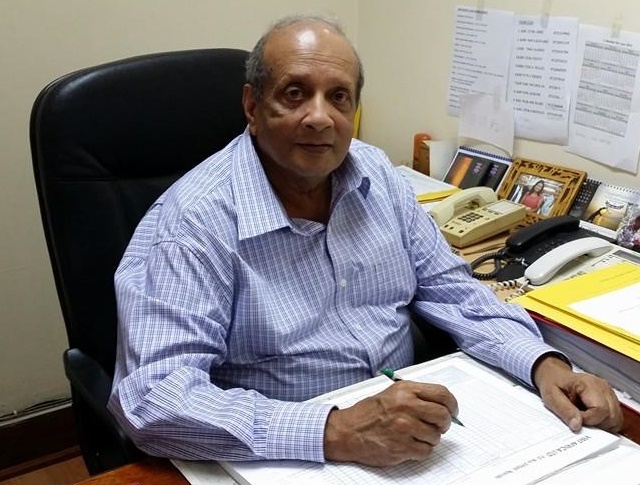 News of our two great wins soon spread and we received calls from Goan staff to play in the district where big firms had formidable teams consisting of mainly Africans. We accepted all the requests as follows: Thika Kenya Canners, Limuru Bata Shoe Co., Ruaraka E.A. breweries, Magadi Soda Company, Arusha African XI and Malindi. the African XI. We called Nairobi for reinforcement and a couple of our players responded. The District Commissioner sent word to thank us as it kept the local’s mind away from politics. We beat the local team and so Ali donated a case of beer as a reward. We won all the games and were lavishly entertained by the Goans who felt so proud of us as we made sure we did not let them down. who we beat by one goal. The next season I moved back to continue to captain the side. The game against Mombasa was that one of our players fouled in the second half of extra time in the penalty area. I marked my centre and looked up to see who was going to kick the ball which was placed on the spot. It was none other than Albert Castanha, the Goal keeper who came trotting along. I gave him one look in the eye and next, to his foot and I knew exactly where he would kick the ball. I gave a jump to my left, stretched my hand as far as I could and tripped the ball over the bar and then rolled to the ground. This was the best save I had ever made. On two occasions, the Kenya Select team officials asked us to play against them as we were the only team who could stand and give them a good fight. We lost the games but with a small margin. 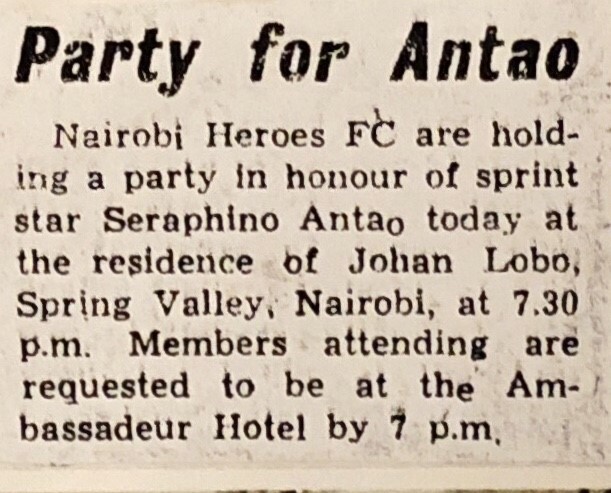 I received a call from Xavier Santiago that Serafino Antao who was arriving in Nairobi from Perth after winning the double Gold Medal at the games and that the Heroes would like to give him a welcome party. I agreed that we would hold it at our residence in Spring Valley and so we were the first to entertain him on his success. 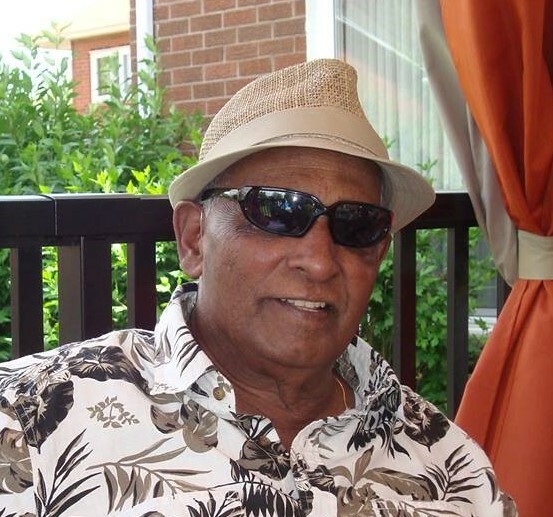 Mr. Leo D'Mello owner / partner in the firm M.P D'Mello and Son tailors and outfitters was a keen supporter of Heroes. He asked us that he would like to manage the team and so we accepted. As mentioned earlier, we had a fine record of winning every game except on two occasions we lost due to no fault of our own. The first game was in the finals of the Nazareth Bros. cup against Sir Ali Muslim Club. One of the Muslim players shot the ball wide of the goal and I indicated by holding both hands of mine in the air. The ball hit a small boy (who was on the sidelines) in the stomach and he was sprawling on the ground in pain. I went to pick the ball but a player for their team shot the ball into the goal and the referee pointed to the centre. I protested and showed the kid who was on the ground still in pain. The referee consulted the lines man at the far-right hand side of the field instead of the left side nearer to the goal. After a short discussion, the referee declared a goal. After the game, both the player and the linesman nearer to the goal told me that the ball rebounded into play after hitting the kid. Incidentally, the referee and the far end linesman were from our rival Goan Club and so they declared that it was a goal. 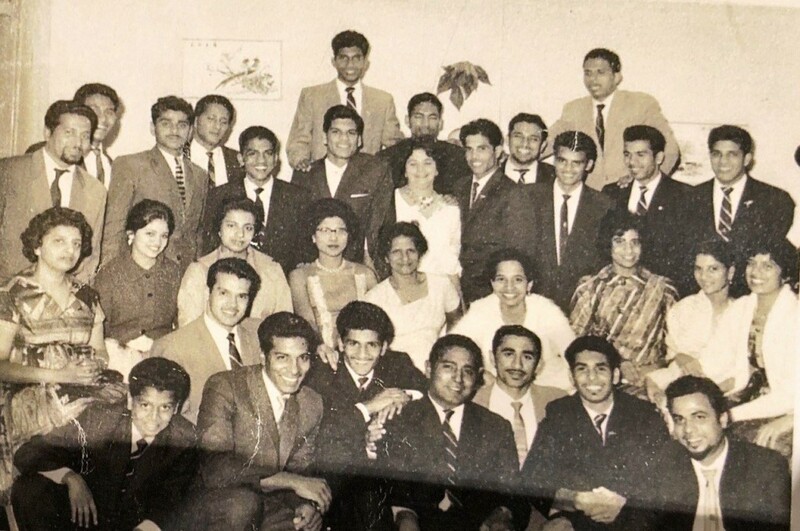 In 1951, I went to Goa on my first long leave. One Friday morning a gentleman by the name of Lube approached me and introduced himself. He was a great football promoter and he had heard about me. He wanted me to play for his team, which was the Siolim XI. Immediately after I agreed, he took me to a doctor to complete a medical examination (as was required by the F.A. of Goa). After that was completed I had to go to a photographer for a photo I.D card. I played a number of games all over Goa, and finally got selected to play for All Goa against Bombay. I could not play in this game however, as I was called to report to Bombay to board the ship for my trip back to Kenya. 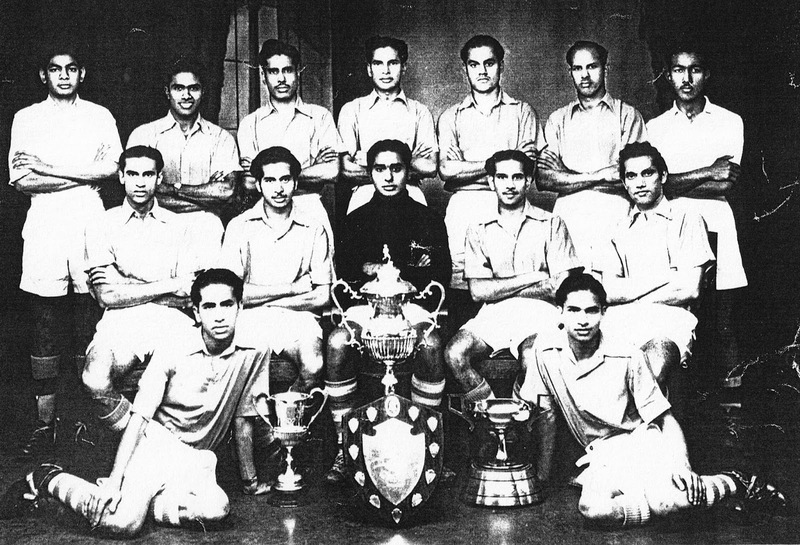 In 1957, I went on my second leave to Goa and met Lube who had a little doubt of my ability after six years, asked me to play against a team in Calangute who happened to be the school boys, I had very little to save. The next game was in Margao against an army side. I was asked to play the first half only and that their regular goalkeeper would play the second half. The army put a lot of pressure in the first half and shot the ball at every angle, but I was at my best. I made save after save, diving to ensure that there was no score in the first half. At halftime, I went straight to the dressing room and met the regular goalkeeper who was eager to go on the field. I wished him all the luck. Unfortunately, our side lost the game 4-0. Lube came to me after the game and said from now onwards only I should play in the goal. Our team was third last in the league and in the knockout, we had a bye in the first round. In the second round, we were drawn against an army team who fielded a weak side as their regular players had to go to the border on duty. We beat them 4-0 and so in the third round we were again bye. Before long, I got a telegram from Lube that we were in the finals against Salgaoncar the top team in Goa at Vasco. The day arrived and the stadium was packed to capacity. I took five of my supporters for the game. I did not mention earlier that we were the only team to have beaten Salgaoncar in the league. The match started and I noticed that they were choosing to shoot the ball from distance. I saved those shots with ease. Later in the match, they tried coming nearer to the goal where I always rushed out and picked the ball from their feet. Just before half time we got a corner and our deep centreback named Peter went to take it. He took the corner and their goal keeper punched it at an acute angle. Peter took his next kick with his right foot, which hit the side bar and went into the goal. In the second half, we defended with all we had to win the cup. Lube was thrilled as it was the first time Siolim had won the trophy. After we had won the cup I was again selected to play for All Goa to play against Daman and Diu. Unfortunately, I could not play as I had overstayed my leave in Goa and had to return to Kenya. On my return to Kenya, I was told by the Nairobi Heroes that they had selected another goalkeeper. So, I decided to play for my office team until I retired in 1959. I would like to take the opportunity to thank all my team mates throughout the years. Some special thanks go out to the two Santiago brothers, Xavier and Robert, for all their hard work in keeping the team together, and to all the new players who succeeded the regulars, namely Francis Fernandes, Sabino Fernandes, Jack Carvalho, Gahib, John and Martin D’ Souza, John Fernandes, Tony Pinto, Sonny Barros, Peter Pinto, Regato D’Souza, Oscar D’Mello, Azis Bola, Anthony D’Silva, Eulogio Braganza, Eddie Rodrigues, Alex Fernandes, and Tony Masky.